Fans are a great way to cool down your house, reduce heating bills and maximise the airflow and freshness of your home. A.D.I. Electrical Services have installed thousands of electric fans and we can help you stay cool today. 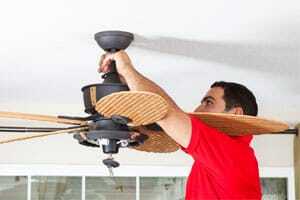 A ceiling fan can add style to your home, keep it cool and save money. We recommend cost-effective ceiling fans that are available in a wide variety of colours, shapes, sizes and styles. There are fans to match all kinds of homes, ranging from Classic American to the Retro and Sleek Modern. We will present you with a range of options and can help you find the best fan to suit your personal tastes and style. A.D.I. Electrical Services offer a quick installation for new ceiling fans, repair any current fans, and make the whole process easy and enjoyable for you. We can help you with ceiling fan installation whether you want to bring a cool breeze to your kitchen, living room, bedroom, bathroom or home offices. It is very important to have a trained professional electrician to perform all electrical fixture installations – Call us today and Stay Cool with A.D.I. Electrical Services!